This is the dry river bed garden at the side of the house. We paved the area about 20 years ago but the garden are not that old. 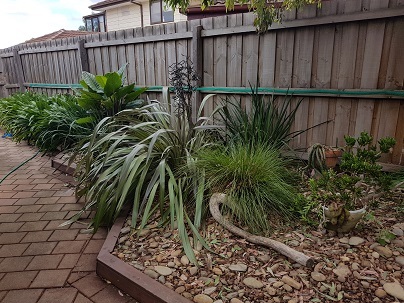 The thing under the plants that looks like a snake is a branch of a tree that I brought back from one of our houses in Tasmania. It has a full loop in the branch and I thought it was interesting. Darn! I should have rolled the hose up before taking the pic. This is the now famous tree that has been trimmed and thinned out. The backdoor neighbour in the two storey house claims that it is dying. It's a Red Gum tree. The planter box that needs straightening up covers the grave of our dog, Bonnie. A gardener we had once made the planter box for me as a gift. This is from the tree towards the backyard. I didn't take a photo of that because it just has an empty elevated garden and a couple of trees. I need to repair the edging of the garden... it has come apart and needs a bracket around it. Another pic of the dry river bed. I thought that maybe you haven't seen these Australian Natives before now. The very back just has agapanthus because it doesn't get much sun. Our water tank is on one side and the fence on the other. This is the front garden between our house and Gordon. His late wife planted this whole garden for me when she first found out she had cancer. The thing in the brown pot is going out in the garbage. It was given to us and we don't want it. The hanging feature is of the tree of life but it faded in the sun. I need to take it down and respray it with black paint. Under the birdbath you can see the plastic butterfly that Immy planted... *LOL* It used to glow in the dark but is worn out. This is opposite the previous pic and is a garden that is forever changing and is about to change again. I've cleared out a lot of plants and a few more need to go. 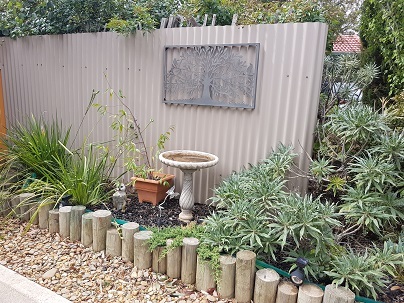 My plan is to plant another apricot tree as a feature and around it plant more Australian natives as they don't draw too much water away from the tree. Last edited by Chayote; 02-12-2019, 12:52 AM. Immy and Andrew's playground. Immy cheats with the basketball hoop by standing on the chair so she doesn't miss... *LOL* Next are Immy's little gardens and her wheelbarrow is sitting on top for some reason. 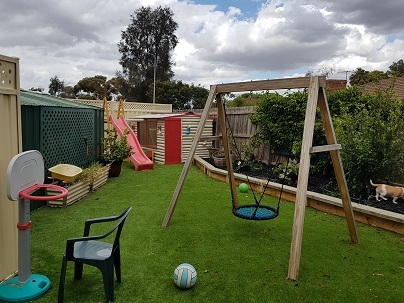 Next there's a lemon tree in a big pot... the slide, cubby house, the fruit tree garden that we call our orchard, spiderweb swing. Grass is synthetic. Sometimes I talk about cleaning out our green shed... that's it on the far left. This is just to show you how quickly our fruit trees have grown in just nine months. 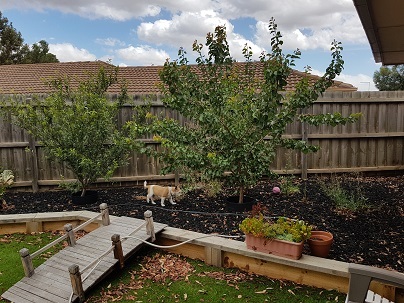 The soil is very good and I feed them... apricot on the right and one of the plum trees on the left. I haven't cleaned up the leaves in there because Immy has a little rake and she loves raking the leaves up. Thus ends the tour... Now you know where I spend much of my time, especially during the summer because I'm outside watering. Thanks for looking. Your gardens are very nice Chayote! I must say, the “infamous tree” looks very healthy to me too. I love it! Are those roll up shutters over the windows? I could sit in the gardens and cocktail mall day. The visual in my head doesn't hold a candle to actually seeing the pictures. You have out done yourself and your yard looks spectacular. Thank you so much for sharing these pictures. Your tree is very nice and adds elevation to your yard. I don't understand your neighbor wanting to take you to court. Perhaps it is an empty threat just to shake you up but nothing will come of it because he has no legal standing. Again, thank you for the pictures. Just amazing and beautiful chayote. Not at all what I was picturing for some reason. That tree makes the garden complete.. don't know why anyone in their right mind would want to remove it. Awesome work. Thank you for humoring me and posting a picture of the tree along with all the other ones. It know that took some work taking them and being out in the sun. Now, where shall we sit out in the evening in your lovely yard and visit surrounded by all your hard work that has been transformed into beauty? You, John and Gordon have and are doing outstanding work. It is all beautiful and I love the tree! hi, muzette... they are electric aluminium shutters that are operated from inside. We have them on three windows, two to shut out the morning sun and the guest room at the back of the house to block out the afternoon sun. g'day, Vera... 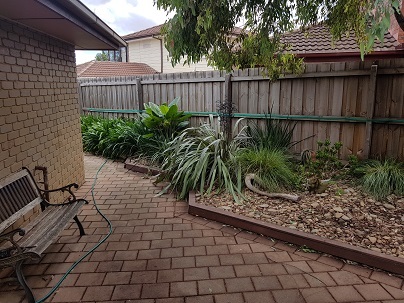 The garden is an ongoing project. 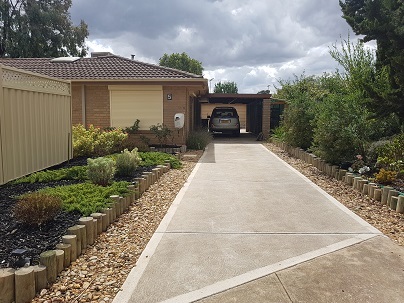 Some of the natives have died in the side garden and need to be replaced. Immy has tipped some pots out and replanted the contents amongst the rocks. I think I'll always be changing and improving the gardens and that's part of the fun. 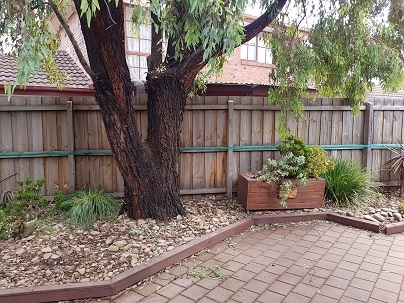 Our side garden was designed around that tree. 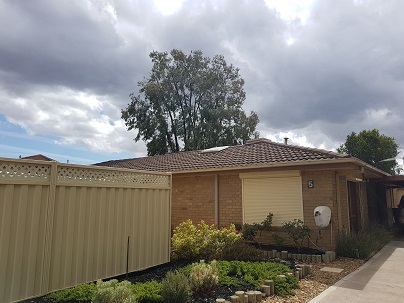 Also without the tree we would have no privacy from their kitchen and bedroom windows which all look straight down onto our house. Thanks, midwestguy. I'd be interested to know what you were picturing. 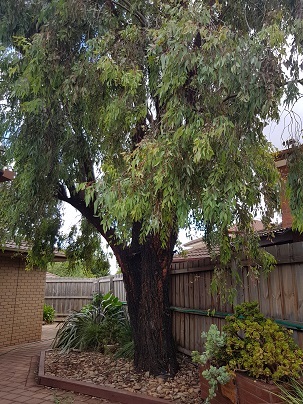 The neighbour has been there for about three years and has complained constantly about the tree starting with saying his wife didn't want to rake up the leaves that it drops in Summer and more recently saying that the tree was riddled with termites and is a danger to his grandchilden. To be honest I didn't think the kids there were his grandchildren. He looks a lot younger than he obviously is. Now it all makes sense that his daughter or son live in the house he owns next door to the one behind us. 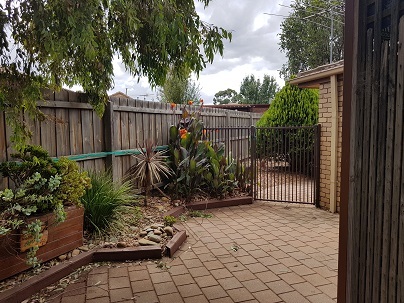 He removed the dividing fence between the two properties and in the process removed the main post that joined four fences. Now our fence has nothing to support it which is annoying. 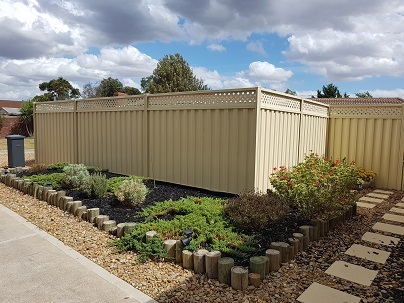 All we can do is put a metal bracket to hold our two lines of fencing together and then cover it up with a plant or wall ornament. Amazing! My apartment is full of plants but I miss a yard and garden. The tree isn't that big. Maybe he really wants to spy on you! I'm glad we have a garden for Gordon's sake because he's spending quite a bit of time with us instead of sitting in his house crying. It's been a tough couple of months since his wife died. Fortunately I need quite a bit of help with it so I'm always picking his brain.